Sorry about the lack of posts. Its been quite the wild ride the last week or so. 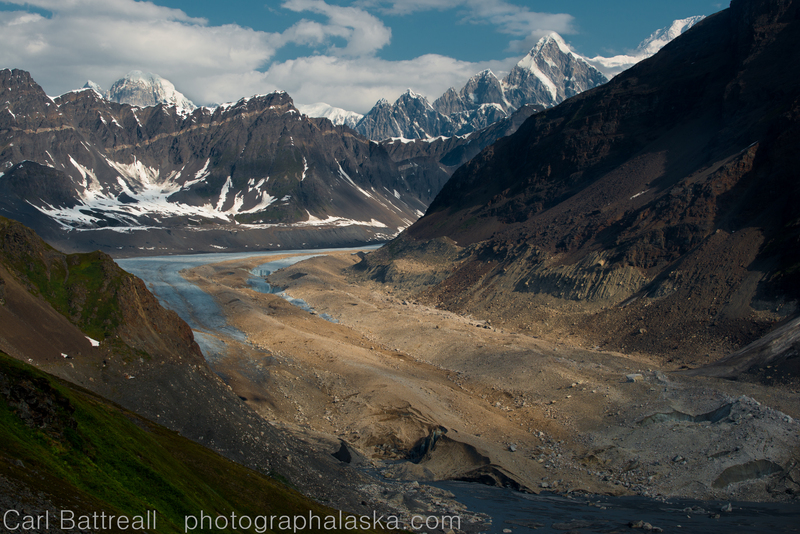 Still trying to finish articles on my trips to the Nuzotin Mountains and Denali. I have also been working on my first ebook, which has been a challenging experience! Two of my guided trips have been cancelled and I had two partners back out of some very important and expensive trips, forcing me to scramble and come up with new destinations and partners. On top of all that, we had a near tragic family event. It is time like these I value all my years exploring remote wilderness. The mountains have taught me to be flexible, to embrace the unknown and to not put much faith in our chosen plans or routes. On the surface, our urban life seems consistent and reliable, but that is just an illusion that leads to disappointment and regret. I continue to try to live in the moment, take life as it comes, find pleasure in uncertainty. 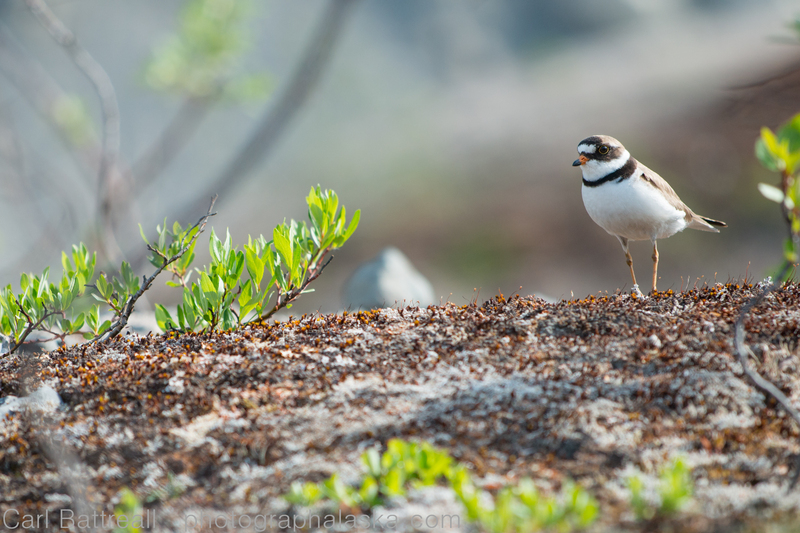 Denali has some really nice backgrounds for wildlife photography. Whenever I give a presentation I am always asked “Where are your bear images?”. The reason I don’t have bear images is because I try my best to avoid any contact with bears while I am exploring remote wilderness. 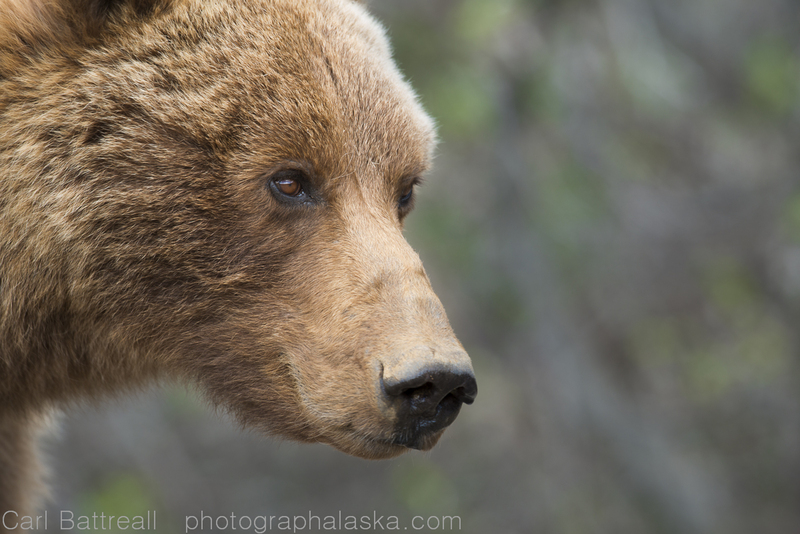 To photograph bears safely you usually need a long telephoto lens, which is too heavy for wilderness exploration and you need to be in an area where they are accustomed to people and have an abundant food supply. 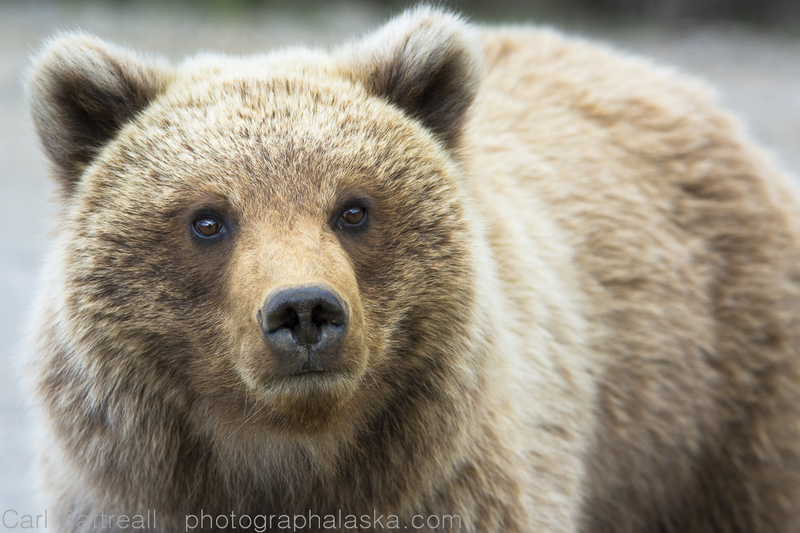 I wanted to get some more wildlife images for the Alaska Range book and the only reasonable place in the Alaska Range to photograph bears is in Denali National Park and Preserve. 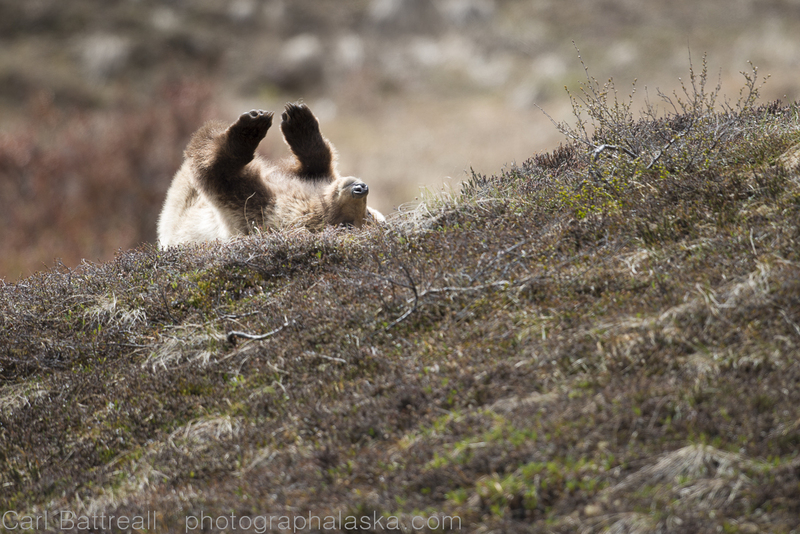 I secured a professional photographer’s permit for a week and my wife and I, armed with a rental 500mm f4 lens, went looking for bears, and boy did we find them! 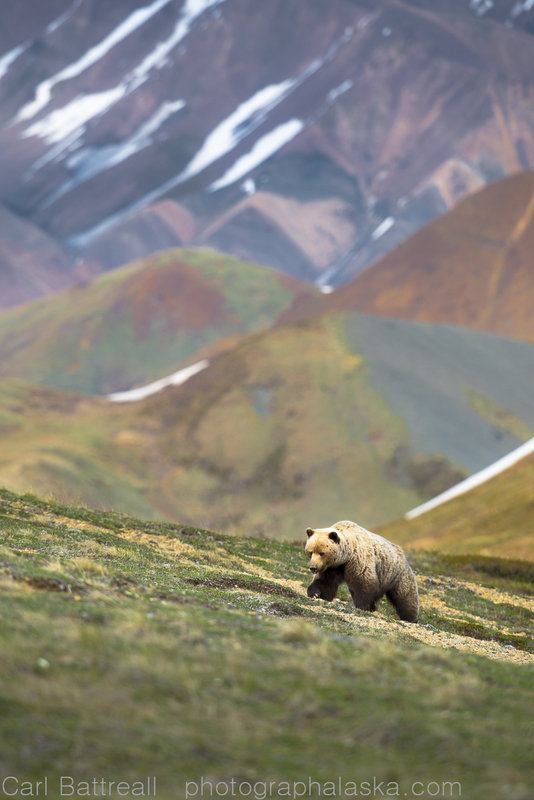 Spring is the best time to photograph bears in Denali. The playful and curious spring cubs are out frolicking. The leaves are just sprouting, making it easy to spot wildlife and the bears really enjoy the spring shoots, grasses and roots that litter the side of the road. Grizzly head shot. 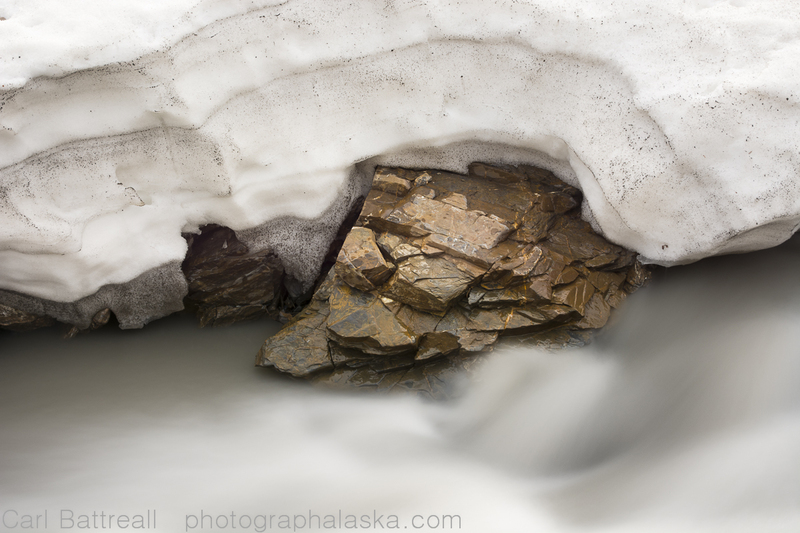 An impossible image in the remote wilderness. Unlike coat shedding wildlife like caribou, moose and Dall sheep, bears don’t look nearly as mangy in the spring. Now, I have had plenty of bear encounters while exploring. All my interactions with grizzly bears have been civil. It has been the black bears that have caused all the trouble. I have had to chase numerous black bears out of camp and had one curious black bear destroy my tent and everything inside. Determined! 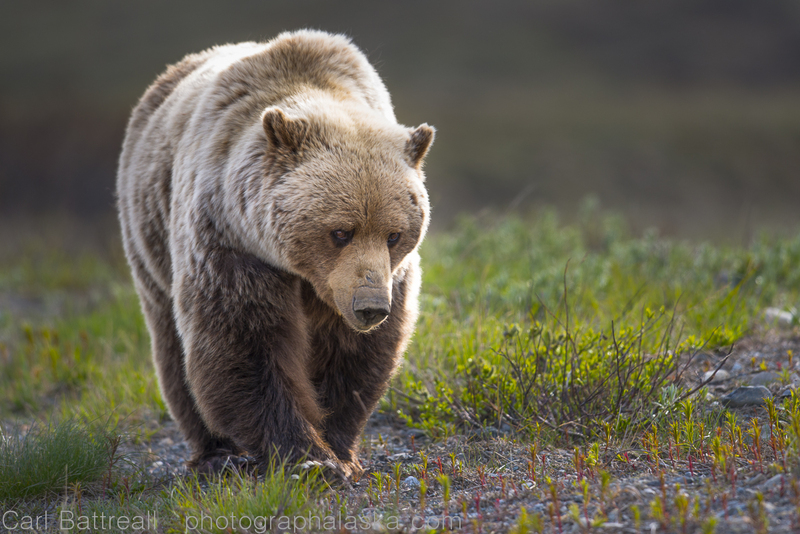 We followed this Grizzly for many miles as it walked head down, determined to get somewhere. I practice strict bear safety and keep a clean camp. All the bears I have had issues weren’t after food, they were young bears, eager to meet the strange, two-legged creature and his bizarre items, like that colorful dome thing. 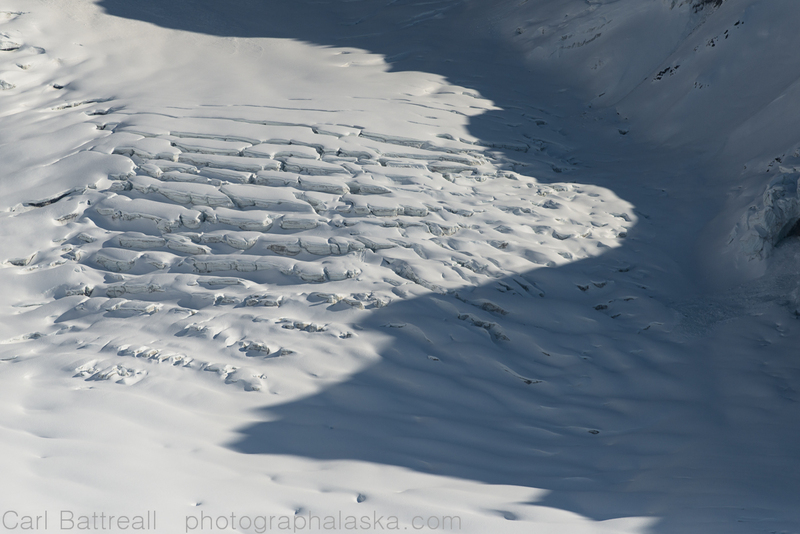 Denali did not disappoint when it came to viewing, if only for a second, a large variety of wild creatures. 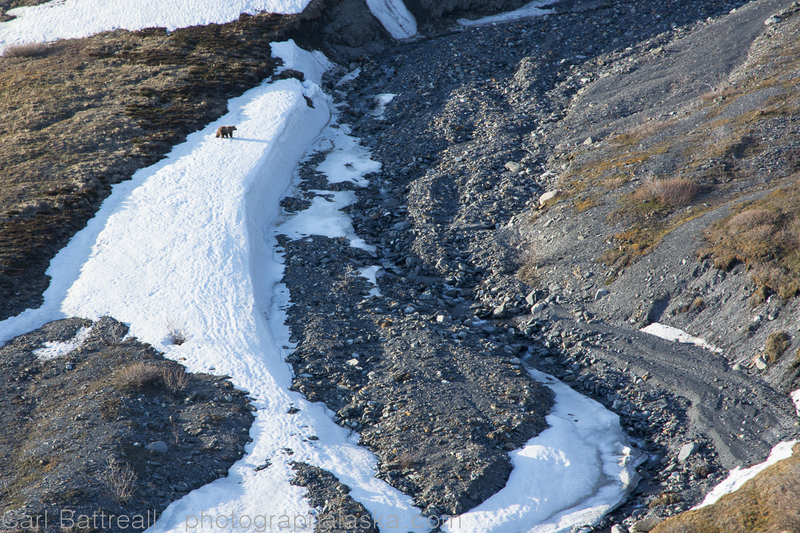 We were lucky to see a lone wolf, three red fox, countless caribou and Dall sheep, moose, lots of nesting birds and a total of twelve grizzly bears. 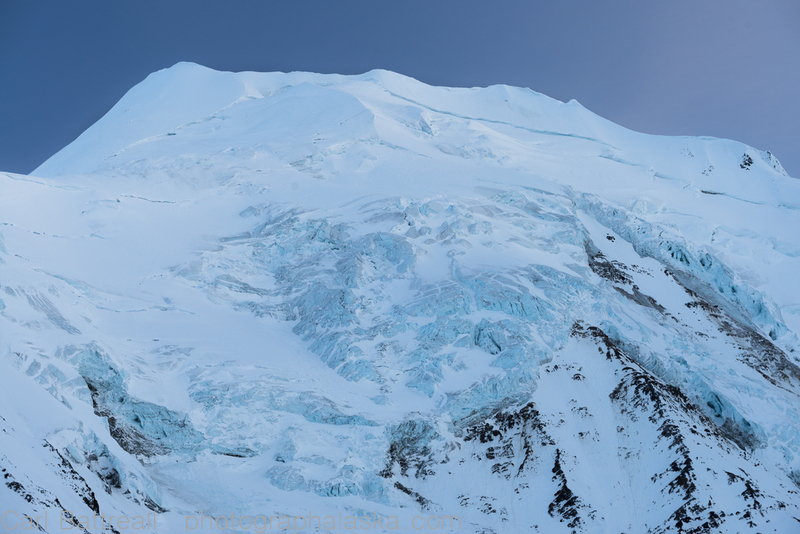 And for a bonus, “The Mountain”, Denali, showed itself for a single day. Smells good in there! 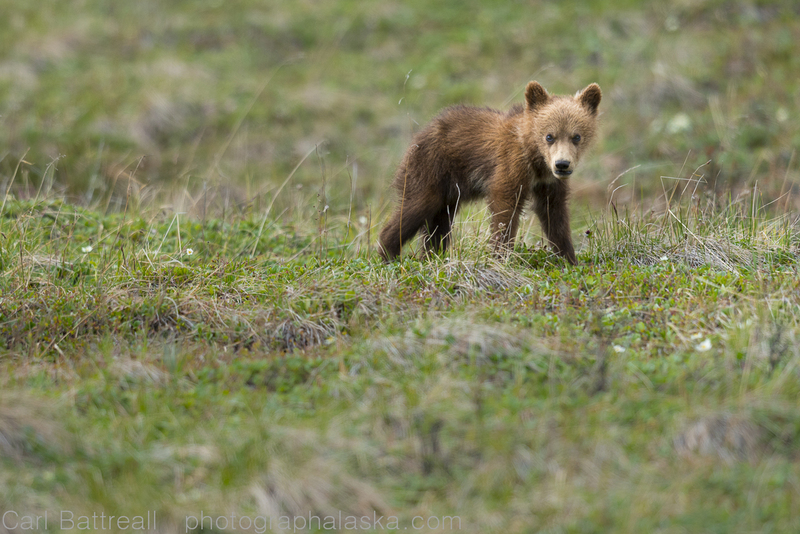 Grizzly cub stops next to our car and wonders what all the interesting smells are? I know I have been critical of Denali National Park and its restrictions throughout the years, but this was a very positive experience for me and I have new respect for the park. Honestly, If your going to have a wilderness area accessible to all types of people, then Denali sets a standard that is hard to match. Two new interviews are up online. I just returned from a fantastic trip into the Nutzotin Mountains. 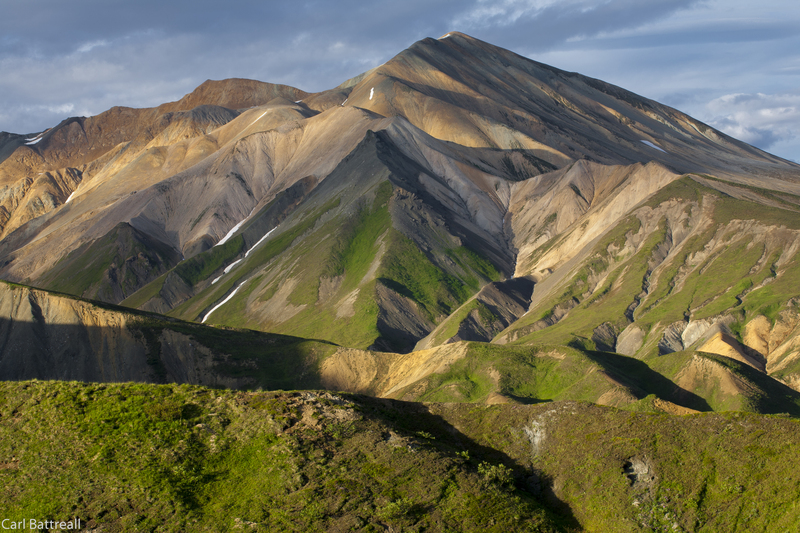 The Nutzotin Mountains are the last mountains of the eastern Alaska Range, tucked in behind the mighty Wrangell Mountains, right on the Canadian border. 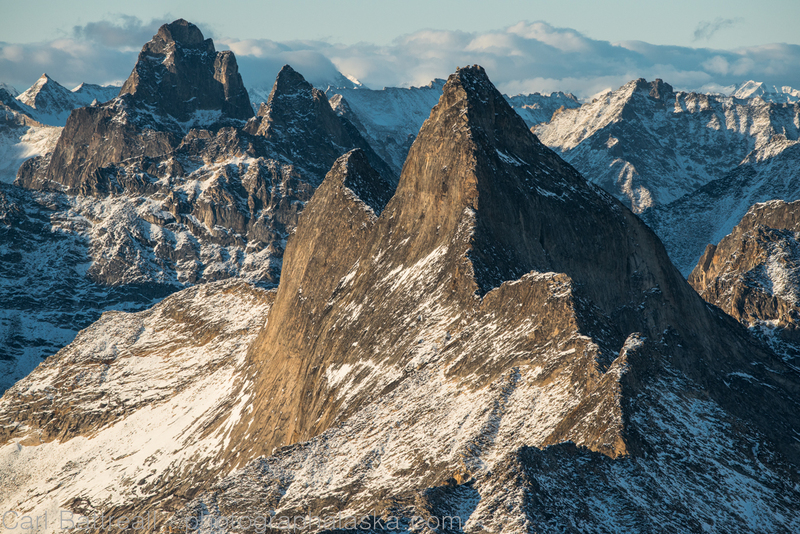 Our ambitions were high: explore as much terrain as possible, get good images for the Alaska Range project and attempt a first ascent of an unclimbed peak. And despite difficult snow conditions and bipolar weather, we were successful. I don’t consider myself a mountaineer. I lack the technical skills to climb anything of note. I do, however, consider myself an explorer, in the classical sense. I like to wander, look up valleys and sometimes, climb peaks. We did make a successful ascent of Hidden Peak (peak 8514) and it was a great, moderate snow/glacier climb. It was a highlight of the trip, however, I also found simply exploring random canyons and valleys to be just as rewarding, one such canyon was what we called Grizzly Gorge. We named the little canyon Grizzly Gorge for a reason. We watched this grizzly wander the exit of the gorge and the hills above it. We had weight restrictions for this trip so I only brought my camera and a single lens, no tele on this trip. This is the perfect distance to be from a grizzly when exploring remote back-country. I had spotted this narrow slice in the multicolored mountains on our approach to the peak and really wanted to explore it. So on our way back down to our pick up point when spent the night at the entrance to the gorge. 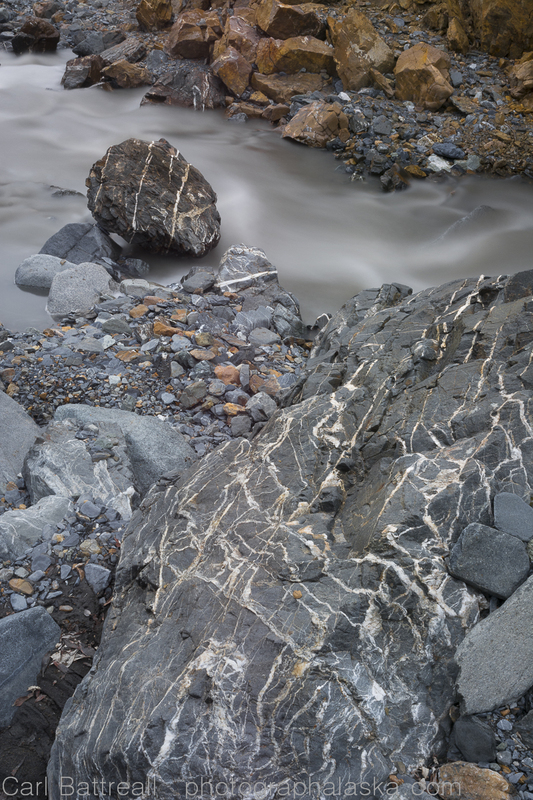 So many intriguing rocks and patterns, I spent hours photographing and in awe. On the map this little canyon barely even registers and would not be anything of note. But it held many beautiful secrets and surprises. And that is why I explore, to find the hidden gems in wilderness, the nameless, the ignored. There was no reason to go in that little canyon and probably no one ever had, but it was no less spectacular than the top of a unclimbed peak. 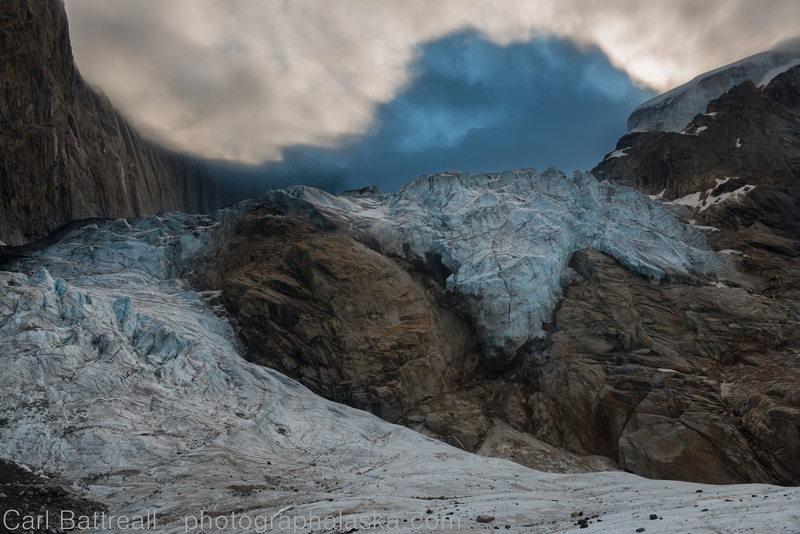 I went to the Gillam Glacier to photograph Mount Deborah and fell in love with the lesser known peaks like Geist, Balchen, Hess and this nameless beauty Peak 9073. 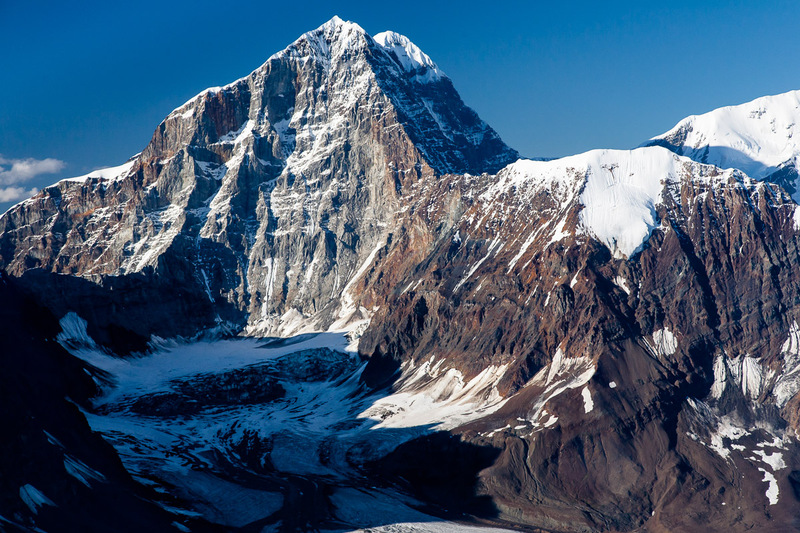 I have never been an icon chaser, never been interested in mountains only because of their notoriety or their size. 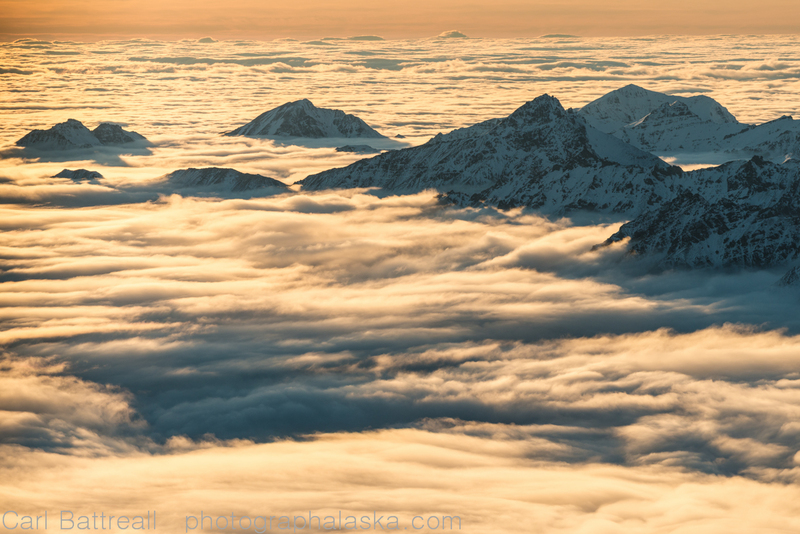 I have always been attracted to the nameless, the remote and the ignored peaks and glaciers of Alaska. 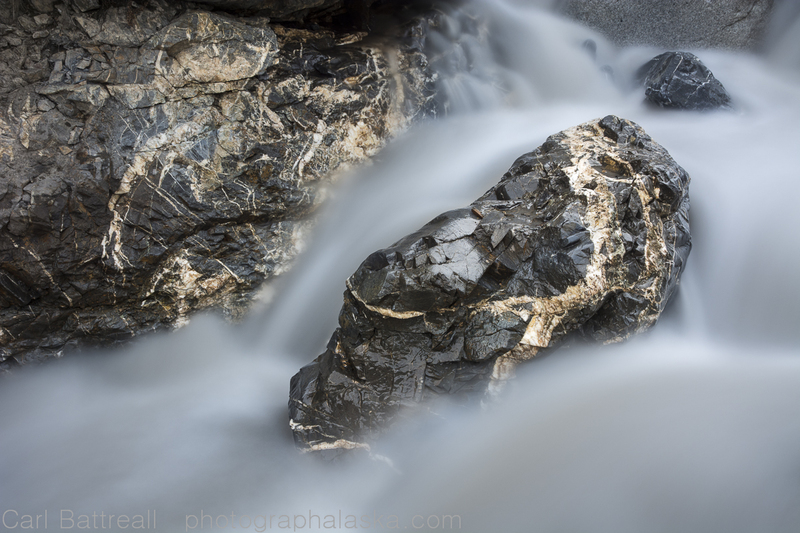 As a photographer I care about light, form and texture, not fame and names. 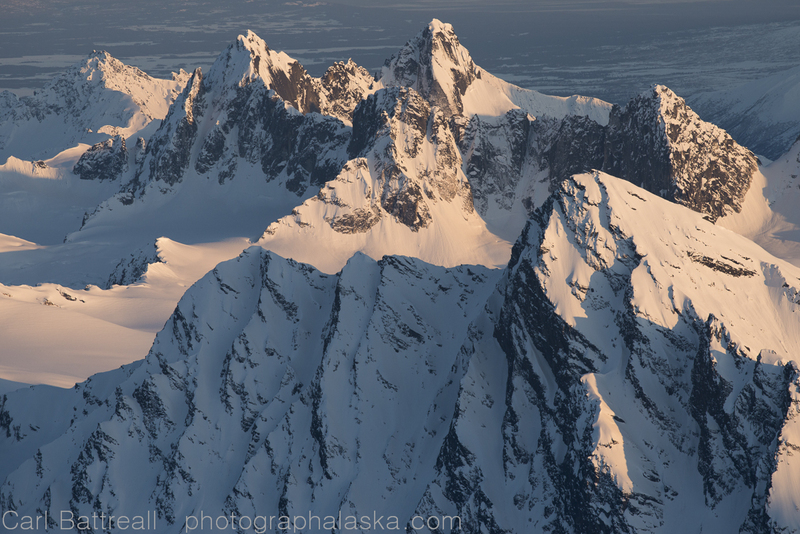 Of course, with the Alaska Range project, it is important to tell a complete story which includes both the famous mountains and the places few have ever seen. This summer will be full of both. 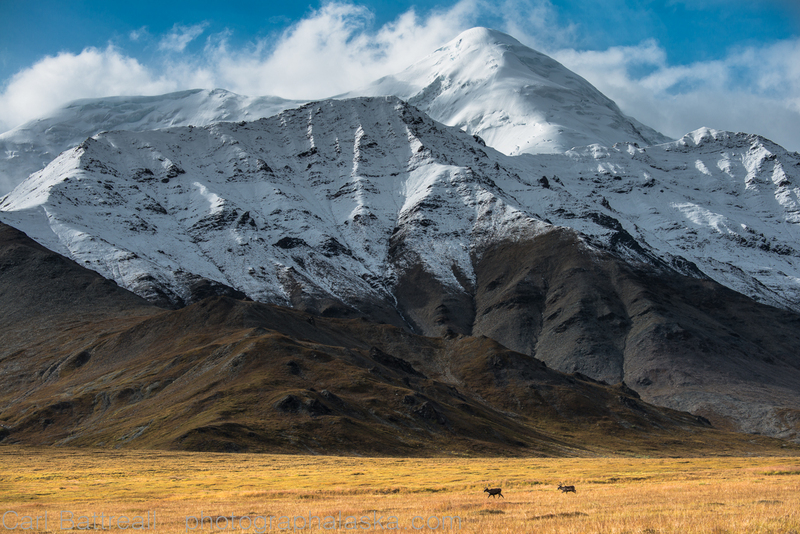 I am exciting by my next trip into the Nutzotin Mountains at the far eastern end of the Alaska Range. My partner and I will be exploring the last glaciated peaks of the eastern Alaska Range and will also attempt to climb one or two of them. 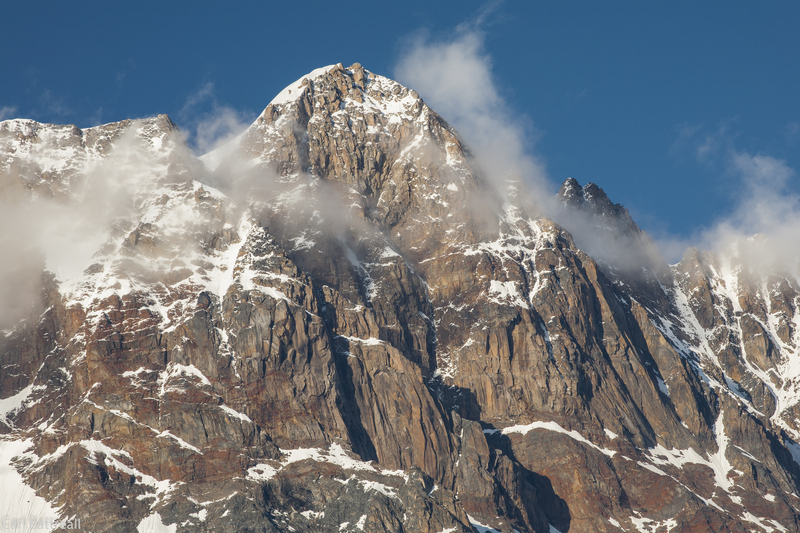 There is a good chance that few, if any, of the peaks in the area have been climbed. 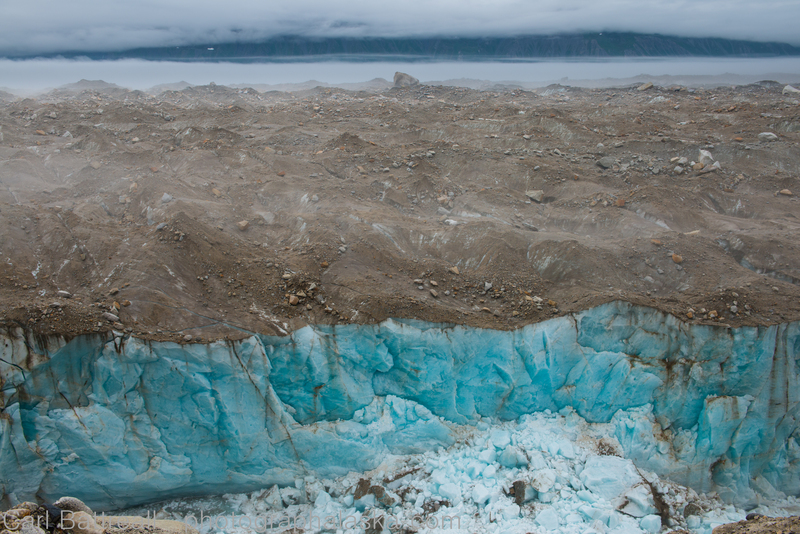 Only one of the glacier’s has a name, which appropriately is, Carl Glacier! 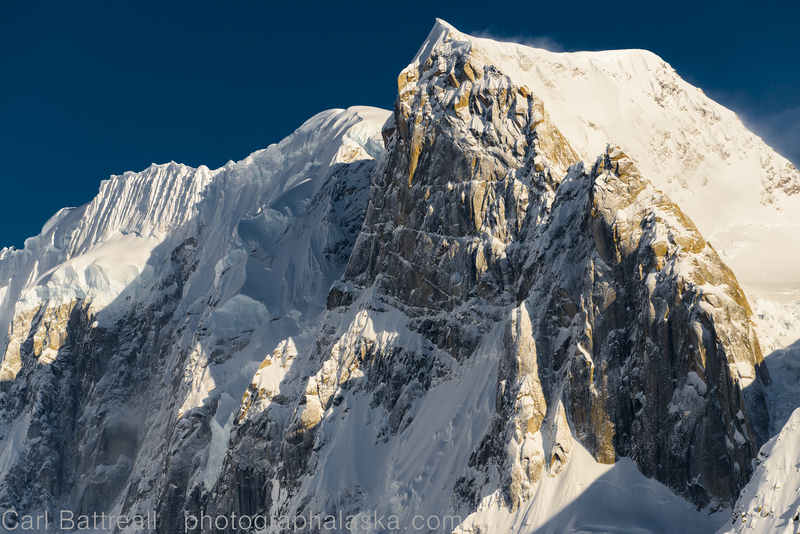 One of harder peaks to photograph in the Alaska Range is the grand daddy, Denali. 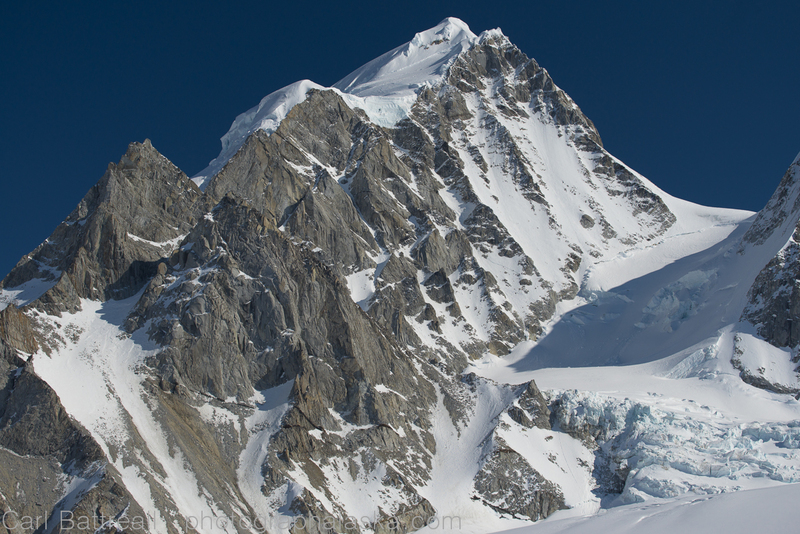 I find Denali pretty unattractive, a big, massive mound of rock and ice. 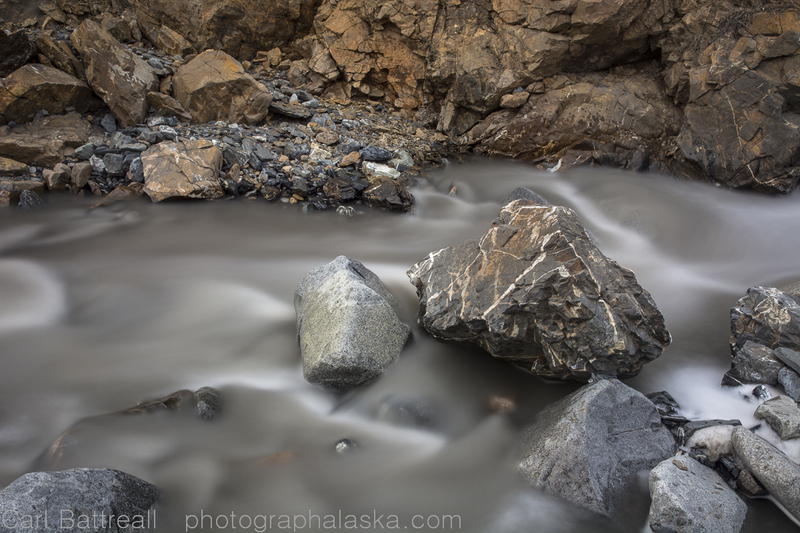 For the 14 years I lived in Alaska, I have never taken a photo of it. I have never had an interest in climbing it. Obviously, Denali needs to be in the book, so the challenge will be to get a few images that are unique from the millions of images of Denali that flood the internet, books and calenders, it will be tough and I am looking forward to the challenge. 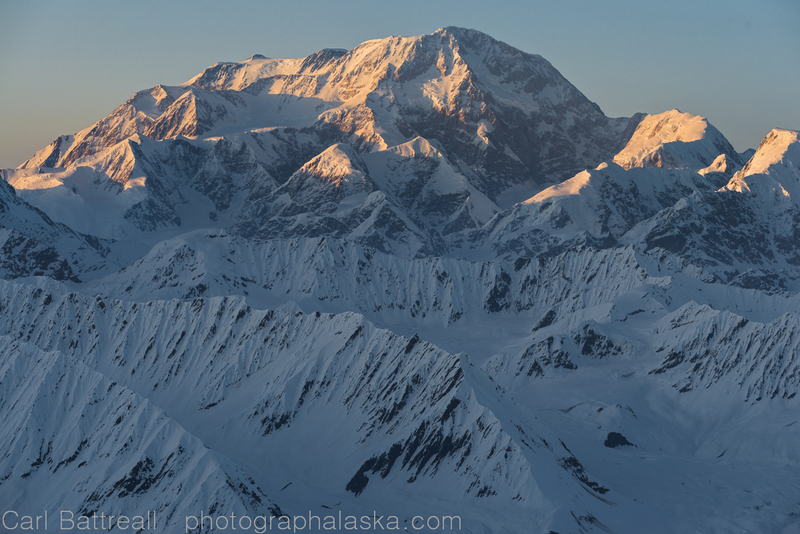 This is the first image I have taken of Denali for the Alaska Range Project. One of this year’s goals is to try and get some unique images of the beast. What can I say? I have just spent a week in the crisp, clean mountain air. A lonely cloud loitered on a mountain or two, but they never lingered long, being sent on their away by the relentless sun. Was it cold? Sure, my hands and toes are still thawing, aching to be warm for an extended period. My body still responds defensively to the sight of the setting sun, knowing the cold suffering that comes with its disappearance. I won’t be doing my usual day-by-day, blow-by-blow blog posts, the trip was uneventful, a simple routine of freeze and thaw. I experienced more sunny days on this trip then I did the entire previous summer in the mountains, I can only rejoice. When the sun sets, a world of hurt begins. Cold evening, Peak 9420. Photography was productive, though predictable. It was a challenge to be creative in a world of white and blue. 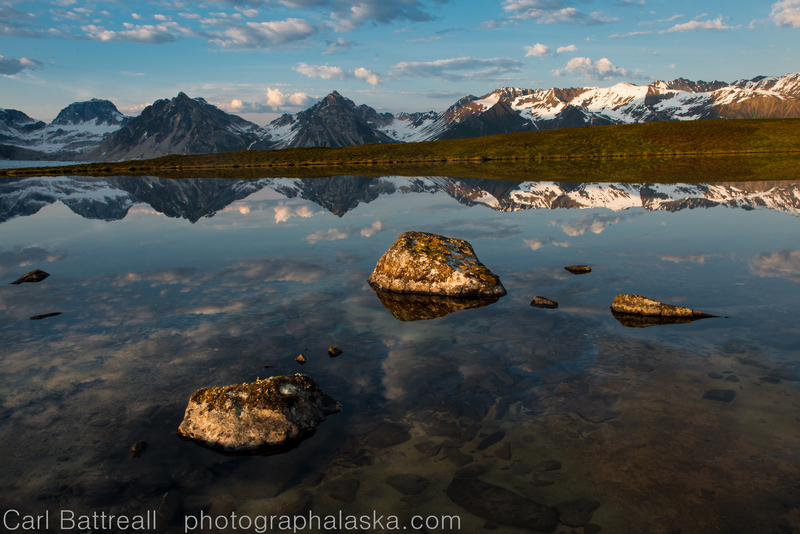 How many straight, uninterrupted, images of perfect mountain symmetry can one person take? There was no weather to play with the mountains, no clouds to absorb the colors of the sun. I became acutely aware of light and shadow. I searched desperately for color in a monochrome world. For the next few weeks I will simply post a series of photographs from the trip, some with a theme, others randomly. I may or may not include a narrative or explanation. Get ready for a celebration of the bluebird day! 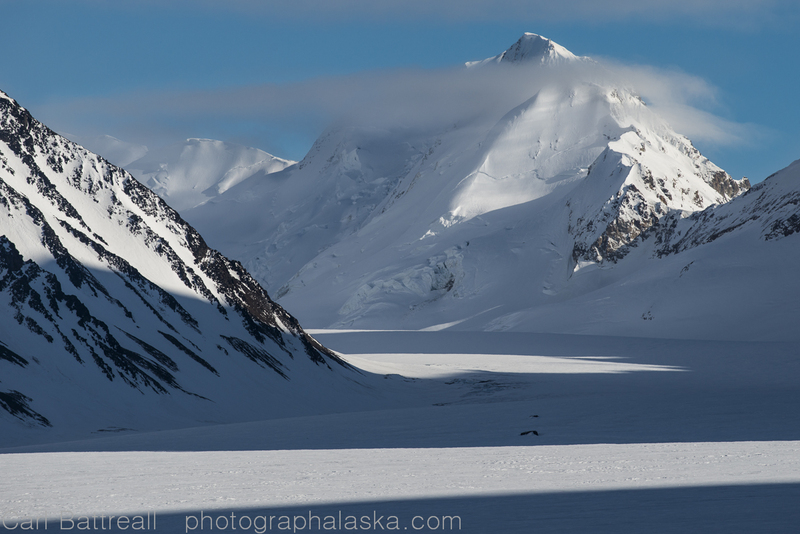 Join me in the Alaska Range! 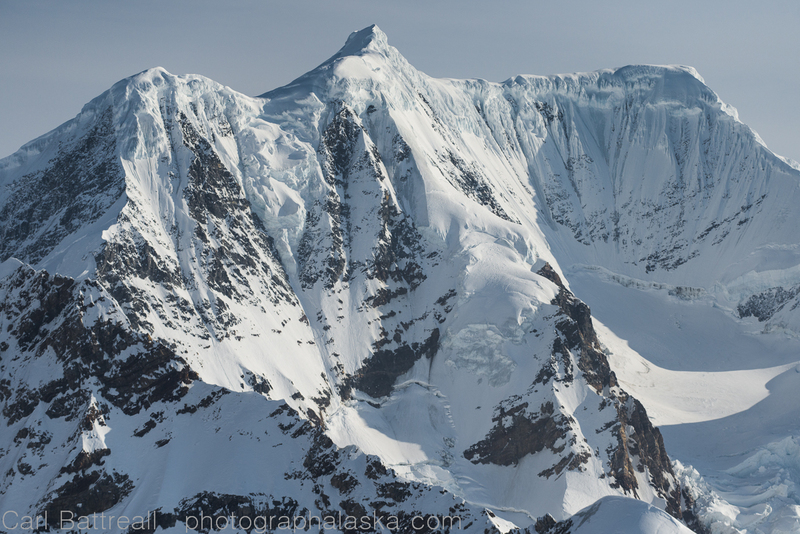 Join me in the heart of the central Alaska Range. 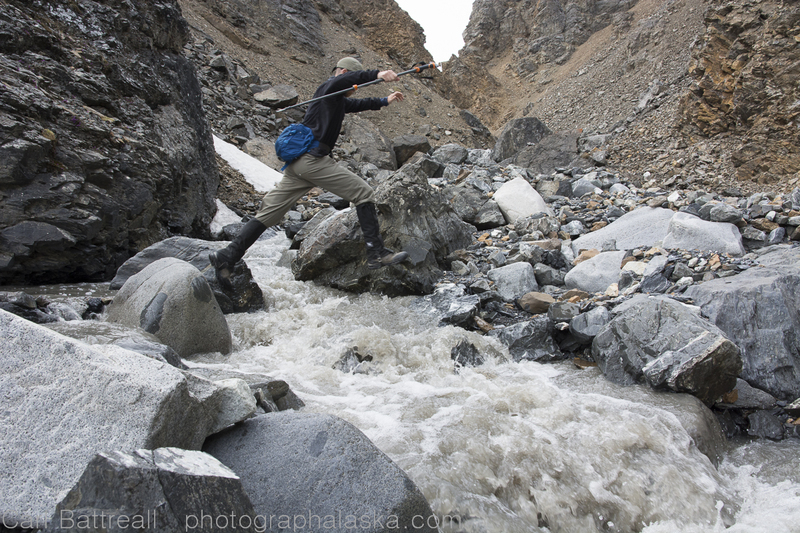 We will spend four days, three nights surrounded by massive peaks and slithering glaciers. We will fly from Talkeetna with K2 Aviation and land on a remote glacier lake, under the shadow of Denali. 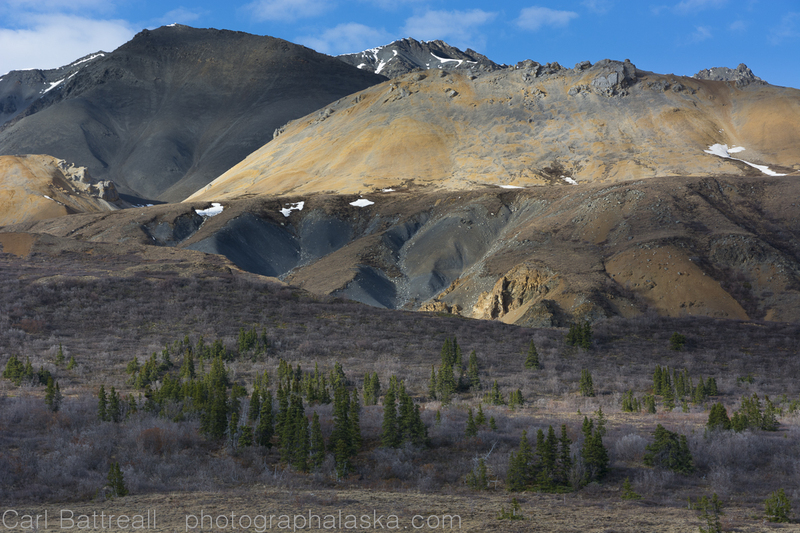 This is one of the few places on the south side of Denali National Park and the central Alaska Range where you don’t need mountaineering skills to explore. The confirmed dates are: are July 10-13th, 2014. Alaska Alpine Adventures will supply all the comforts: tents, sleeping bags while Alpine Appetites will supply gourmet back-country food. This will be an intensive photographic journey. We will be in remote wilderness far away from any roads or people. We will stay up late and get up early, chasing the light as it illuminates the surrounding peaks, including a unique view of Denali. Because of my Alaska Range project, This will be my only tour or workshop this year, so if you want to join me on an adventure, this is it. Mother coming in to rescue her eggs.